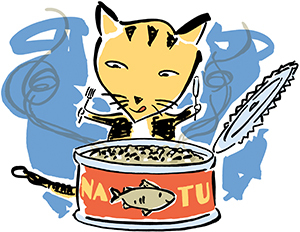 Cailin Heinze, a faculty member in the nutrition service at the Foster Hospital for Small Animals at Tufts, responds to a reader’s question about her tuna-loving cats. Q: When I was pregnant, I was told to avoid canned tuna so my baby would not be exposed to mercury; now my pediatrician suggests I limit my toddler’s tuna consumption. So I’m wondering: Is it safe to give canned tuna to my cats as a treat? And should I stop feeding them cat food that contains tuna? A: I’ve never seen a report of mercury poisoning in a cat fed tuna-based commercial cat food. We also lack data about how much mercury is actually in tuna-based cat foods, as well as statistics about mercury levels in cats that eat those diets. However, it seems reasonable to assume that when a cat eats tuna as its main diet, it ingests far more mercury on a body-weight basis than a human does—even a person who eats a lot of tuna. Signs of mercury poisoning in cats—loss of coordination and balance, difficulty walking—can mimic other illnesses, including thiamine (a B vitamin) deficiency. Because mercury toxicity is not common in cats, it may not be the first thing a veterinarian suspects. So it’s possible that mercury poisoning happens, but is not diagnosed. Until veterinarians know more, limit your cat’s tuna consumption to occasional treats of canned chunk-light tuna—not albacore, which is from a larger species of tuna with mercury levels almost three times higher. These rare indulgences should account for no more than 10 percent of your cat’s daily calories. Occasional tuna treats are probably safe, but we advise against feeding your cat tuna-based foods on a daily basis. This can be a challenge, because tuna is a common ingredient in many cat foods, and cats tend to be very particular about which foods they’ll eat. Try replacing tuna-based foods with those made from fish that have lower concentrations of mercury, such as salmon. Please email your questions for “Ask the Vet” to Genevieve Rajewski, editor, Tufts Veterinary Medicine, at genevieve.rajewski@tufts.edu. Because of the volume of inquiries, we cannot respond to every question submitted. For any pet health issue, owners should contact their veterinarian.